Bring your family, friends, neighbors and coworkers and join us at our second annual Whistlepig, Clearwater's festival of music, food and merriment. 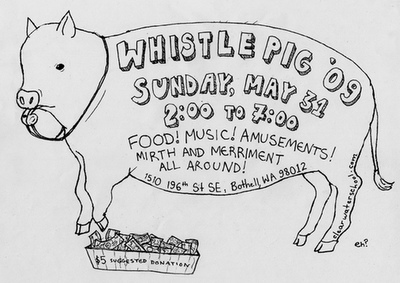 Whistlepig is Sunday, May 31, from 2:00-7:00 PM, at The Clearwater School, 1510 196th St SE, Bothell WA. Suggested donation is $5 per person. Christine Traxler & Christian Hoffman of Pipers Creek, Rob & Heather, and the Clearwater Singers. Other attractions include delicious food served all day, face painting, bake sale, fortune telling and chakra readings, and raffles. For more information call (425) 489-2050 or email The Clearwater School.